The completely redesigned Toyota RAV4 is ready to take you wherever you want to go. Whether you go for the Premium Limited, powerful and stylish XSE Hybrid or off-road ready Trail, we have a RAV4 just for you including Front Wheel Drive, All Wheel Drive Models and the RAV4 Hybrid available in the spring of 2019. Finding the model that's right for you is easy with the New RAVs long list of standard and optional equipment including 8 Inch Display Audio Screens with Birds Eye View Monitor and Digital Display Rear view Mirror with Homelink and Entune 3.0, available Premium JBL Audio Systems, Navigation, Entune Safety Connect and Destination Assistant. Depending on the model and trim available premium comfort features can include Heated and Ventilated Front Seats, Eight Way Power Adjustable Driver seats with Memory, Heated Rear Seats, Wireless Charging, Power Moonroof and Power Back Door, Alloy Wheels, Dual Zone Automatic Air Conditioning, Smart Key System, Heated Leather Steering Wheel, Rain Sensing Wipers, Blind Spot Monitoring and Rear Cross Traffic Alert. Powering the New RAV is 203 HP, 2.5 Litre, 4 Cylinder Engine mated to an 8-speed Automatic Transmission. Gas models feature Multi‑Terrain Select for optimized traction on mud, sand, rock, dirt and snow. Call us today for further details and availability of the most refined RAV4 yet or stop by we're at 1200 Leathead Road in Kelowna. Class leading with a host of comfort and safety features including Air Conditioning, Tilt Steering, Power Windows and Locks, Power Heated Mirrors, Display Audio Systems with Bluetooth, Input Jack and USB and Steering Wheel Controls, Heated Front Seats, Fold Down Rear Seats and Roof Rails. The popular 2018 RAV4 is available in Front Wheel Drive and All Wheel Drive versions and there are also Hybrid models for maximum efficiency. For safety the RAV4 includes Toyota Safety Sense Pre-collision System which includes Auto High Beam, Dynamic Radar Cruise Control and Lane Departure Alert along with Toyota's Star Safety System with Smart Stop Technology, Stability Control, ABS Brakes, Traction Control, Brake Assist and Electronic Brake Force Distribution. The RAV4 is at the top of it's class in the crossover SUV market, delivering an appealing mix of safety, dependability, roominess, and fuel economy. With 9 models to choose from at Kelowna Toyota we have the RAV4 that's right for you. We would be happy to arrange a test drive where we can demonstrate all of the RAV4's features and benefits. 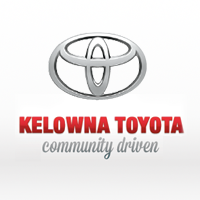 At Kelowna Toyota our goal is to make your entire vehicle purchase and ownership experience a positive one. We appreciate that purchasing a car, truck, van or SUV is a major investment of your time and your money. We strive to take care of you and your vehicle to ensure you get the best return on that investment and maximum enjoyment from your vehicle. There's only one Crossover SUV that has Toyota's legendary reputation for quality, reliability and safety and that's the 2018 Toyota RAV4. Don't forget to ask about our financing plans and Aeroplan Air miles incentives program.